The philosophy behind the Pistol Shooting Dynamics Line is very simple: focus on the achievement of the ideal synergy between shooter, firearm, and ammunition. 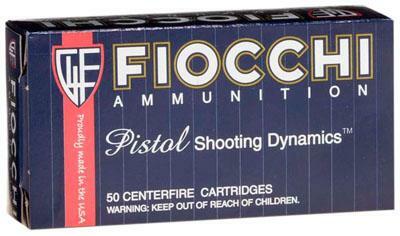 Fiocchi keeps developing and improving its pistol and revolver cartridge products. This line has been an over twenty-five year favorite of the shooters in the USA. It encompasses LRN, FMJ, JHP, FMJHP, and JSP bullet configurations in all the most popular calibers. Just take a look at the ballistic charts and you will notice that in terms of performance, Fiocchi's Pistol Shooting Dynamics Line take no back seat to any other manufacturer.